Ehrlichiosis is a tick-borne infectious disease of dogs. It first gained attention as a significant disease when military dogs returning from Vietnam during the 1970's were found to be infected. The disease seems to be particularly severe in German shepherds and Doberman pinchers. The organism responsible for this disease is a rickettsial organism. Rickettsiae are similar to bacteria.Ehrlichia canis is the most common rickettsial species involved in ehrlichiosis in dogs, but occasionally, other strains of the organism will be found, i.e., Anaplasma platys (formerly Ehrlichia platys), Anaplasma phagocytophila (formerly Ehrlichia equi) and Ehrlichia ewingii. Because of its origin in military dogs in Vietnam, it has also been called "tracker dog disease" and "tropical canine pancytopenia." In the U.S., E. canis is considered endemic in the southeastern and southwestern states. A. phagocytophila (E. equi) is found on the West Coast (California) with recent reports of East Coast occurrence (New Jersey). How is a dog infected with Ehrlichia? "Ehrlichiosis is transmitted to dogs through the bite of infected ticks." Ehrlichiosis is transmitted to dogs through the bite of infected ticks. 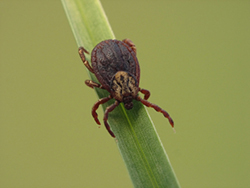 The brown dog tick, Rhipicephalus sanguineus, is the main carrier of the Ehrlichiaorganism in nature. Other tick species, particularly Ixodes (A. phagocytophila), Amblyomma and Otobius (E. ewingii) have also been shown to transmit Ehrlichiosis in dogs. The sub-clinical phase represents the stage of infection in which the organism is present but not causing any outward signs of disease. Sometimes a dog will pass through the acute phase without its owner being aware of the infection. These dogs may become sub-clinical and develop laboratory changes yet have no apparent signs of illness. The sub-clinical phase is often considered the worst phase because there are no clinical signs and therefore it goes undetected. 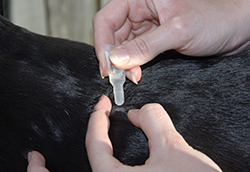 The only hint that a dog may be infected during this phase may be after a blood sample is drawn, when the dog shows prolonged bleeding from the puncture site. A low platelet count (called thrombocytopenia) and/or hyperglobulinemia (high levels of globulin in the blood) may be found incidentally on laboratory tests. Dogs that are infected sub-clinically may eliminate the organisms or may progress to the next stage, clinical Ehrlichiosis. Clinical Ehrlichiosis occurs because the immune system is not able to eliminate the organism. Dogs are likely to develop a host of problems: anemia, bleeding episodes, lameness, eye problems (including hemorrhage into the eyes), neurological problems, and swollen limbs. If the bone marrow (site of blood cell production) fails, the dog becomes unable to manufacture any of the blood cells necessary to sustain life (red blood cells, white blood cells, and platelets). "Since the presence of antibodies to Ehrlichia canis is the basis of the most common diagnostic test, in the early stages of disease dogs may be infected yet test negative." Rarely, the organism itself may be seen in blood smears or in samples of cells taken from the lymph nodes, spleen, and lungs. This is a very uncommon finding. Therefore, detection of antibodies, coupled with appropriate clinical signs, is the primary diagnostic criteria. A newer test, a PCR assay, is becoming available in certain veterinary laboratories. If a dog is suspected of having Ehrlichiosis, this test should be considered. Dogs experiencing severe anemia or bleeding problems may require a blood transfusion. However, this does nothing to treat the underlying disease. Certain antibiotics are quite effective, but a long course of treatment, generally six weeks, may be needed. Your veterinarian will discuss treatment options with you. Can anything be done to prevent Ehrlichia infection? Ridding the dog's environment of ticks and applying flea and tick preventives are the most effective means of prevention. Can I get Ehrlichiosis from my dog?